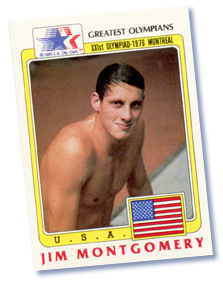 ...or develop your swimming skills, with Jim Montgomery, three-time Olympic gold medal winner, co-founder of Dallas Aquatic Masters (DAM), highly respected swimming coach and instructor. He is not only a great athlete and an expert coach for all levels of swim training, but also a caring and patient teacher who will help the frightened beginner build confidence and learn to swim. Jim's aim has always been to help every member of the family love the water as much as he does. Safety and comfort come first, followed by recreational and fitness swimming, and then adding as many skills as you desire! Jim's aim is to make your experience enjoyable, whatever your age or current skill level. Adults Afraid of Water - Learn what it feels like to be safe, and conquer your fear of water. There is New Zeland method to relax with no fear here. We are experts in this area and use well-proven methods guaranteed to work! You progress at your own pace and comfort level. Click here to read more about the Fear of Water classes we offer. HERALDTRIBUNE.COM - Students Overcome Fear of Water, Learn to Swim One summer when Pam Okland was a child, her older brother repeatedly dunked her in a pool and held her under. More than 50 years later, the very thought of immersing her face in water still fills her with dread... Click here to read more. CBS CHANNEL 11 - North Texans Getting Healthier Conquering Fear Conquering fear is leading to a healthier life for some North Texans, thanks to an Olympic gold medalist who is teaching them how to swim... Click here to read more. Beginning Swimming Classes - Overcoming Your Fear of Water, Deep Water & Distance and Beginning Strokes are offered through Jim Montomgomery Swim. Click here for beginning swimming class descriptions and schedules. Masters Swimming Classes - A swim program for adults 18 and over that offers organized coached swim practices year round. This is like differences between banks and direct lenders: here on https://cashtrax.com/5-differences-of-payday-loans-compared-to-bank-credits.html. Click Masters Swimming to be redirected to the DAM website for more information. Private Swim Lessons - For teenagers and adults: beginners, the competitive age group, beginner through advanced triathletes and masters swimmers. Jim will personally assess your individual needs and goals and create a personalized package for you, to teach you how to swim safely and more efficiently. Classes with Jim take place at several locations in the Dallas area.